We usually associate pancakes with breakfast, served with butter and maple syrup or fresh fruits and cream. Tuck along the same row of shophouses where the italian restuarants, pubs and board games cafe sits at Selegie Road is this unique cafe called Strictly Pancakes. 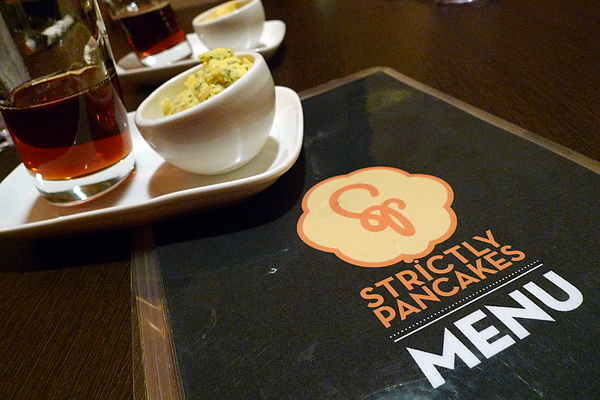 Strictly pancakes serves pancakes as a main course with meat, vegetables or seafood. The combination sounds weird - "will my stomach reject it?" 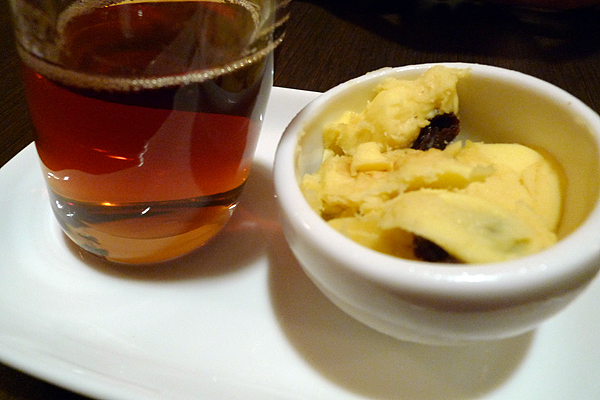 All side pancakes and main course comes with maple syrup and a choice of butter - salted, unsalted, garlic and herb or run and raisin. My friend and I choose to go the main course way. We each selected a main dish to share. I choose Beef Me Up. The extre-thick pancakes were really thick. It's about the same thickness as the pancakes from Mr Bean, but bigger in circumference. 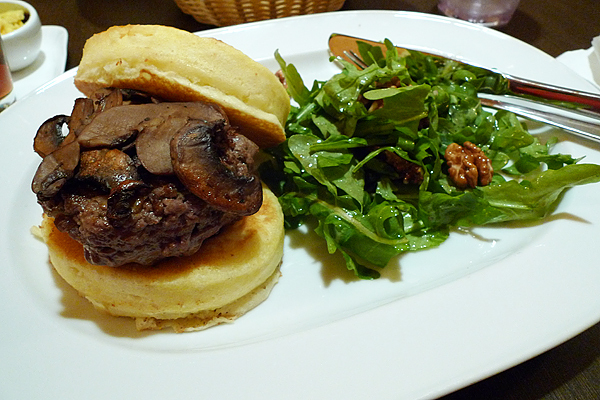 The beef patty was disappointingly dry, different from the claimed "juicy" in the menu. The ingredients they put inside the beef makes the whole patty taste funny the more you have it. I didn't quite like the taste. The sautéed mushrooms were totally dried up. Some slices of mushroom had a strong heat and peppery taste. The arugula salad was nice and tasty, vinaigrette dressing with walnuts in it. This dish sees the idea of rosti. 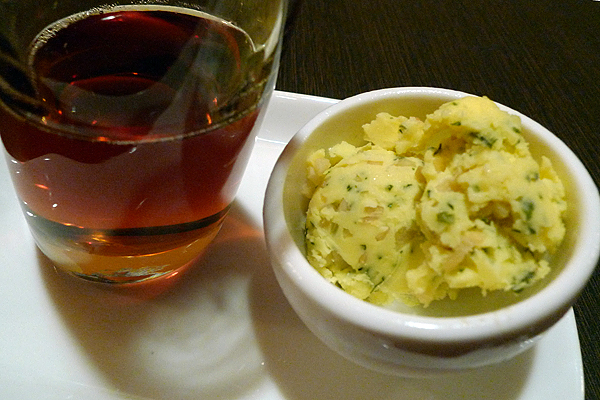 The pancake batter is mixed with potatoes, leeks and cheese and shaped. It looks like the japanese pancake, okonomiyaki. As usual the sautéed mushrooms are of the same pot, so they are as dry as those in Beef Me Up. 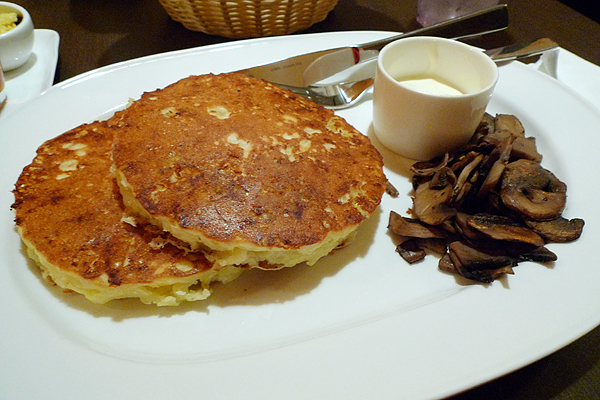 This dish is served with sour cream, which gives the idea and presentation similar to rosti. 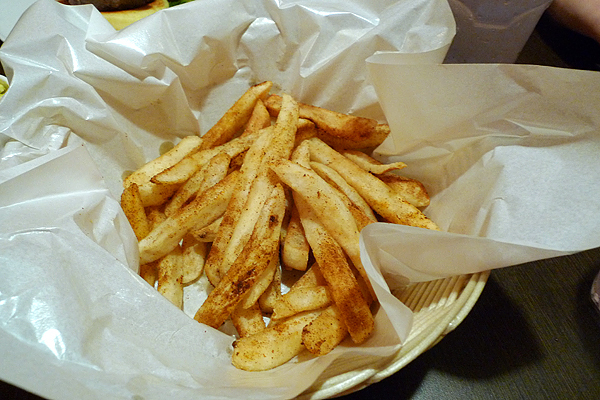 We also ordered fries and it came tossed with some unknown powder. It has some burnt tasted and we guess that it's roasted curry powder or something similar. Overall was filling but I guessed that idea of having pancakes with main course items doesn't quite fit our mind sets. Nevertheless it was a good try on their food. Their weekend breakfast menu looks better.